For Developers / Investors / Any Buyer Looking to make a large Profit! 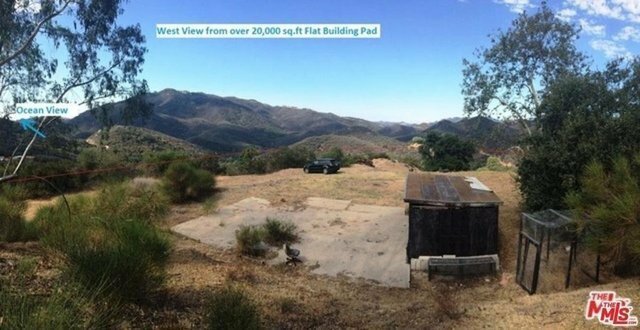 Tremendous Malibu Property Development -15 Individual Parcels subdivided in the 1930's with a paved road - Loftyhills Road. Buy and sell properties individually for $1m profit - Permit and sell Properties and make $2m or Build homes and sell and make $4m or more. There are 8 obvious house building sites to build your own gated community of homes in the Malibu Hills. Great location in Malibu! Located near the intersection of Kanan Dume Road and Mulholland Road and only 5 minutes to Pacific Ocean and 10 minutes to Westlake/Valley. Tremendous Potential and Opportunity! This is the only and last property in Malibu a developer can build multiple homes or sell multiple properties. There is a small barn and foundation with electricity lines on the upper pad of this property. See photo section for detailed directional aerial map of lots and location. Best Malibu Land Buy Ever!